This sensuous coral travel bracelet is a true gift of inspiration. 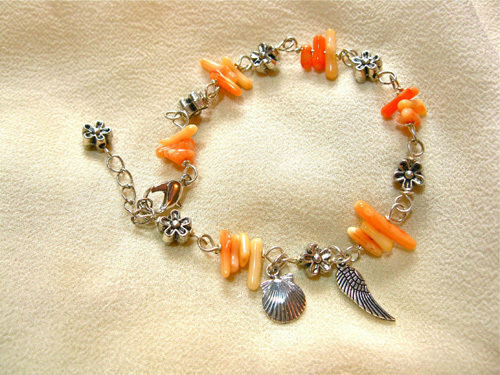 It comprises a mix of coral chips and pretty bali-style silver-coloured flower beads, and features a small angel wing charm which symbolises hope, enlightenment, guidance and protection. There is also a scallop shell charm, symbolic of the Camino de Santiago pilgrim route: The 1,000-year-old pilgrimage to the shrine of St. James in the Cathedral of Santiago de Compostela is known as the Way of St. James (El Camino de Santiago - in Spanish). Some 200,000 people travel to the city each year from all over the world to find inspiration and reflect on their lives in a supportive environment. Many carry with them a scallop shell symbol. Dimensions: The bracelet is fastened with a lobster clasp and measures approx 7" in length with an additional 1.25" extender chain, so suitable for most wrist sizes. It features a pewter angel wing and a sterling-silver scallop shell. The supposed calming and protecting qualities of the coral, plus the angel wing, together with the concha scallop shell, make this an ideal gift for people setting out on a journey - or going on a Gap Year, for example. A special present with a powerful meaning and an ideal gift for those meeting new challenges under stressful conditions e.g. Travelling, entering a Competition, or Exam. Comes gift-wrapped, like all our presents - and we can print a personal message on your behalf. More information about Coral . .